Hacking became a serious problem of internet world. Your all important data and person information is always in danger because of this hacking. By hacking your mail account hacker can harm you in many ways. Today we discuss how to know your Gmail account is hacked or not in this article. He can misuse your important data or personal information. In this situation how can know your Gmail account is hacked or not. Gmail is more often used site for sending mails by people. About 500 million people use Gmail, who send about 100 billion mails daily. So for users it is important to know how they can save their Gmail account from hacking. Although it is important for users to know how they can save their account, but they should know if their account is hacked or not. Here we will see few ways by them you can know that your account is hacked or not and whether your account is using by another person or not.Google provides you few tools, by using them you can lock your account any time. 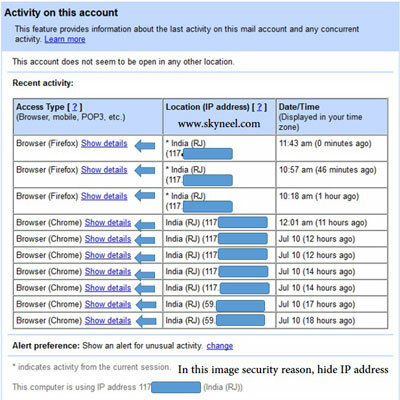 This tool will tell you that when, from which browser and from which IP address your Gmail account is opened. By this you can save your Gmail account from hacking. If you sent mail to wrong address or person you can stop the process of sending this mail for few time. you can activate this feature by going to Gmail setting. Step 1: First open your Gmail account, scroll down till the end and you will see an icon of ‘Details’ in the right bottom corner. See in this image. Step 2: When you click on ‘Detail’ option you will see a pop-up window opened in front of you, here you can see ‘Activity Information’. Here you can know that your account is used from which location, on what time and till how much time. Along with it you will see browser and IP address too. You can match this IP address from your office and home’s IP address whether your account is used by some other person or not. See in the image. Step 3: In Activity Information window you will get an option “Sign Out All Other Sessions”. When you click it your Gmail account will be log out from all devices. Note: By using these option you can know whether your account is used by some other person or not. If it is so, then change your password instant. I hope you like this know your Gmail account is hacked or not guide from which you will be able to easily know your Gmail account is hacked or not without any extra efforts. If feel any problem in this guide then please use comment box. Thanks to all.